Promotional Feature: In the second set of benchmarks we take a look at how the SSHDs fare against normal hard drives when subjected to real world data transfer tests. In our last article we pitted the Seagate SSHD against normal hard drives and found that they performed better than normal hard drives across all aspects. In this set of benchmarks we’ll get to know if normal day to day transfer operations. First off, let’s go through the specifications of the SSHD we’ll be testing. File write tests were performed with an 8GB sequential file and also a second sample that consisted of assorted files. We note that the transfer rates are consistent for sequential data with the normal hard drive scoring nearly the same as the SSHD. When it comes to assorted file transfer tests we see a tremendous performance increment. The SSHD performed roughly twice as good as the normal hard drive. When it comes to file read test, we see a similar performance as noted with the write tests. The sequential data showed a similar performance while yet again the assorted set of files showed an equally high performance increment which is roughly twice as the normal drive’s numbers. Intra drive tests involve creating two partitions in the same hard drive and then performing the transfer tests between these two partitions. In other tests the hard drives perform a single function. They either read from the platter or write to the platter and do nothing else. While the intra drive test has the drive head move rapidly against the platter reading from a sector and then writing to another sector. Those drives with good seek time perform better since the time between a read operation and the subsequent write operation is less. Therefore, more data is transferred in lesser time. In the graph below we see that the normal hard drive has a more consistent performance for sequential as well as assorted data. While the Seagate SSHD not only has a higher base performance but there is also some disparity between sequential and assorted data. The normal hard scored 141.59 MBps and 143.58 MBps for assorted and sequential data respectively. While the SSHD knocked up 179.87 MBps and 219.13 MBps for assorted and sequential data respectively. We ran some more synthetic benchmarks to help reaffirm the transfer speeds we recorded with the real world tests. For this purpose we ran Crystal Disk Mark which is widely accepted in the industry as a valid benchmark. In the first test, we have a sequential data transfer test which has a consistent performance when it comes to SSHDs while normal hard drives are not so much the same. We recorded an average of 172 MBps transfer speed for SSHDs while normal hard drives recorded a base level of 151 MBps on write tests while read tests showed an improved 163 MBps transfer rate. Random data tests with the synthetic tests show a similar performance for both the normal hard drive and the Seagate SSHD. Random data tests are more of a depiction of what performance one can expect after conditioning of the hard drive. Conditioning refers to the process of normal usage of a hard drive over an extended period of time which ensures plenty of data fragmentation and data re-arrangement based on the software you use. Overall, the Seagate SSHD performs slightly better than the normal hard drive. 4K tests is another random hard drive test that tests a massive amount of data scattered all over the hard drive. These files are numerous in number and test the hard drives ability to seek across the drive. In a real world scenario, 4K tests simulate multitasking best. Ideally, a hard drive that is going to be used as a boot drive for your operating system should have better performance in 4K tests. 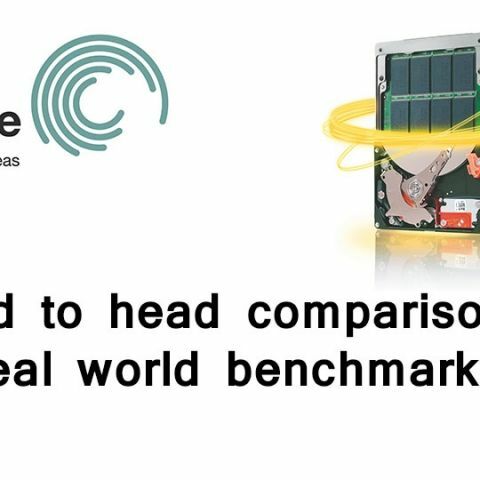 In read tests the normal hard drive scored 0.753 while the Seagate SSHD scored 0.861. In the write tests the normal hard drive managed 1.008 and the Seagate SSHD recorded a 50% improvement coming in at 1.592. The last in this set of tests is a 4K test with a queue depth of 32. Queue depth indicated a series of linked operations that are stacked one after another. Higher queue depth is a problem for mechanical hard drives since a higher queue depth would mean more spin cycles are needed to ensure completion of a queue. SSDs don’t have this problem as they have much better access time than normal hard drives. SSHDs are a hybrid construction which utilises elements from both, mechanical hard drives and SSDs. From the tests performed we get to see that SSHDs are more consistent when it comes to this test. The normal hard drive performs better than the SSHD when it comes to the read test but suffers significantly in the write tests. From what we’ve seen so far we noticed that the SSHD performs consistently better than a hard drive. Certain tests did put a normal hard drive ahead of the SSHD but the adaptive learning feature doesn’t come into play in synthetic benchmarking scenarios. However, in a more real world environment this feature does matter and we see the SSHD performing better than normal hard drives. Can data reduction technology help reduce global warming?